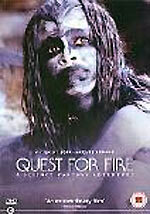 More information about Second Sight's Quest For Fire DVD - due on September the 25th - is now available. The film is presented in anamorphic 2.33:1 format, with Dolby Dgital 2.0 audio (at 192kbps) (not in 5.1, as some sources claim). The bonus features are two commentary tracks (one by director Jean-Jacques Annaud; the other by cast members Ron Perlman, Rae Dawn Chong and Executive Producer Michael Gruskoff); a video interview with Annaud (33m); a contemporaneous behind-the-scenes featurette (25m); fifteen short (2-6m) Video Gallery clips, which are photo galleries, presented in slideshow format, with commentary by Annaud, each focussing on a particular aspect of the production (Set Design, Costumes, Mammoths, etc). I don't want to sell these short - they're basically mini-featurettes, without moving video content. The only potential drawback remains its "UKVV as cut" BBFC status (as noted when the disc was announced, in the News entry for the 31st of July). Menu screens from the disc can be found here. Universal Pictures will release a Spike Lee Box Set on September the 18th. It will include Do The Right Thing, Mo' Better Blues, Jungle Fever, Crooklyn and Clockers. The press release doesn't mention any any bonus features, and there's nothing about the technical details, either. The set has an RRP of £34.99. Do The Right Thing, Jungle Fever and Clockers are already available as an Anthology Collection box set, which has an RRP of £19.99. The release of the Tittybangbang DVD - announced here last week - has been delayed: it will now be released in "mid-November". Paramount's Best Dressed Trekker competition website is now live. Time for your weekly reminder to visit the Incoming page, which features dozens of new titles, additions and corrections since last week. Please use our affiliate links! My thanks again to Ceri and Ben, for their work in keeping the database up to date! 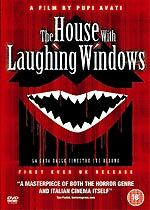 Nouveaux Pictures is releasing Pupi Avati's atmospheric 1976 horror film The House With Laughing Windows (La Casa dalle finestre che ridono) on DVD on September the 25th. The film, about a man who is hired to restore a mysterious church fresco depicting the martyrdom of Saint Sebastian, is presented in anamorphic 1.84:1 format, with Dolby Digital 2.0 audio (at 192kbps). The English subtitles are player-generated, but there doesn't seem to be an option to switch them off. Sadly Nouveaux's disc does not include the very good sixteen-minute retrospective documentary that's on Image's Region 1 edition. The RRP is £15.99. Making any of Avati's genre movies available is very laudable, but it's a shame that we now have two good versions of The House With Laughing Windows, and yet the wonderfully creepy The Arcane Sorcerer (L'Arcano incantatore) languishes without an official release... hint hint! Universal Playback have created a website in support of their forthcoming Battlestar Galactica - Season 2 and Battlestar Galactica - The Movie DVD releases (which are due on August the 28th). It features an introduction by Battlestar stalwart Dirk Benedict (who will also be answering questions from fans), a competition, and other goodies (including a trailer for the Season 2 set). You can find the site here. More information about these releases can be found in the News entry for August the 4th. Paramount Home Entertainment offers Trekkers another compilation of themed episodes culled from three of the Star Trek series in Star Trek: Q Fan Collective, which gathers together every episode that Q appeared in (eight episodes of The Next Generation, one episode of Deep Space Nine, and three episodes of Voyager). The four disc set offers the episodes in 4:3 format, with Dolby Digital 5.1 audio. Three of the episodes feature text commentary tracks (Deja Q, Q-Less and Death Wish). The set is released on September the 4th (four days before Star Trek's official 40th Anniversary). Would it have killed Paramount to commission a new interview with John de Lancie for this set? Infinity is releasing the 1993 Daryl Hannah remake of Attack of the 50 Ft. Woman on DVD on October the 9th. The spoofy HBO film, which also stars Daniel Baldwin, Christopher Guest and Frances Fisher, is presented in 4:3 format. There are no bonus features. The RRP is £15.99. 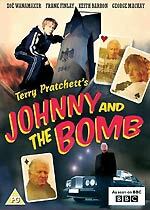 Warner Vision will release a DVD version of Terry Pratchett's time-bending BBC series Johnny and the Bomb on September the 4th. The series, which was adapted from Pratchett's award-winning novel by Stig of the Dump's Peter Tabern, stars Zoë Wanamaker, Keith Barron and Frank Finlay. The disc will feature an "extensive" interview with Pratchett, who discusses the transition from book to screen, the special effects, and the programme's themes. According to Play.com, the disc will apparently present the series, which originally aired in three parts, in omnibus format. The RRP is £17.99. Tartan Video will release Kevin Wilmot’s satirical "what if" documentary C.S.A. – The Confederate States of America on November the 13th. The documentary speculates what might have happened if the Confederate South had won the Civil War, and, as a result, slavery hadn't been abolished. The film will be presented in anamorphic widescreen format, with a choice of Dolby Digital 2.0, 5.1 and DTS 5.1 audio tracks. The disc will include a trailer, and will be accompanied by notes by Spike Lee biographer Kaleen Aftab (Lee presents the film).